It’s hard to miss the sudden surge of attractive sedans wearing the Chevrolet Bow Tie on highways everywhere, and for once it’s not government employees and rental-car customers behind the wheel. 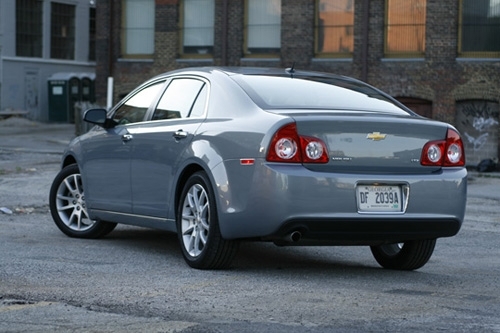 The Chevrolet Malibu has grown from disposable transportation into a car buyers can actually enjoy driving. Though largely the same as last year’s model, GM has made a few key improvements to the formula, namely in the gearbox category. The four-speed automatic of last year’s car has been replaced with an efficient six-speed version that helps boost the car’s fuel economy to a baffling, but much-appreciated 33 mpg highway. Genuinely attractive styling outside and an interior that makes the competition blush have all stayed on from last year’s effort too, making this mid-size sedan a great pick for the price. If you’re looking for something that stands out from the canvas of Japanese sedans in your neighborhood, the Malibu has plenty to offer. The Malibu’s 2008 redesign is still fresh and attractive with a high shoulder line that rises to meet a low, leaning roof. GM’s done a fantastic job with this car’s handling thanks to a fully independent suspension, too. It’s comfortable without the nauseating body roll and nose dive typically associated with American sedans. Though the six-speed automatic transmission is an improvement over last year’s four-speed, the unit lacks refinement. Shifts can be hard and abrupt, and the transmission seems to have trouble deciding on which gear is best between 55 and 65 mph. During hard acceleration, the four-cylinder, 169 horsepower engine can feel underpowered as well, though in anything other than aggressive maneuvers there’s plenty of gusto on tap. 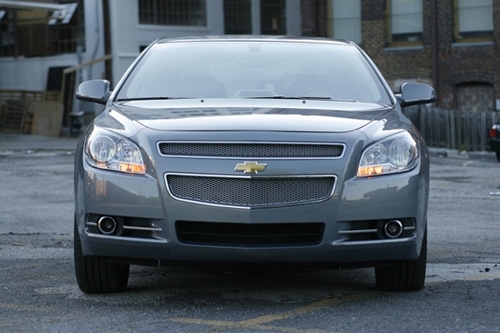 Inside, the 2009 Chevrolet Malibu LTZ is quiet and comfortable. The 2.4-liter four-cylinder engine is very smooth and provides enough power to get around town without the high revving and vibration usually associated with smaller motors. The power steering is unusually well-weighted and communicative for this class of cars, and as we said above, the suspension makes for a vehicle that’s actually fun to drive. GM has also blessed the Malibu with brakes that are more than capable of bringing the 3,400-lb car to a stop. Though visibility is hampered by thick A-pillars and larger C-pillars, sizeable side-view mirrors are on hand to help out. Under the hood is General Motors’ 2.4-liter Ecotec four-cylinder. Though the 169 horsepower, 160 lb-ft of torque unit stacks up well against similar motors from Honda, Toyota and Ford, it lacks any real punch. What it doesn’t offer in power it more than makes up for in efficiency – delivering fuel economy that’s on par with subcompacts. The engine is mated to a six-speed automatic transmission that puts power to the front wheels. In LTZ trim, the Malibu comes standard with an impressive list of features. Automatic climate control, SIRIUS satellite radio, a premium sound system, power adjustable, heated front seats, leather interior and stylish 18-inch alloy wheels are all part of the package. Thanks to a huge trunk and folding rear seats, the car offers up an amazing amount of functionality, too. This Chevrolet also boasts five-star front and side impact crash ratings thanks to dual front, side curtain and side impact airbags. As with most GM vehicles, the Malibu LTZ features OnStar for free in the first year. With audible turn-by-turn directions, Bluetooth hands-free calling and a gas station locating service, it’s a handy system that replaces the typical in-dash screen. 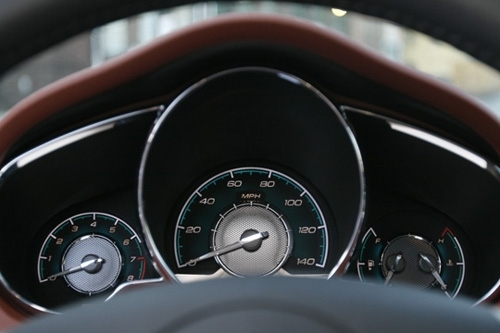 While you may miss the maps at first, not having to glance down at a screen eliminates a distraction from the cabin. Here’s where this Chevrolet shines. 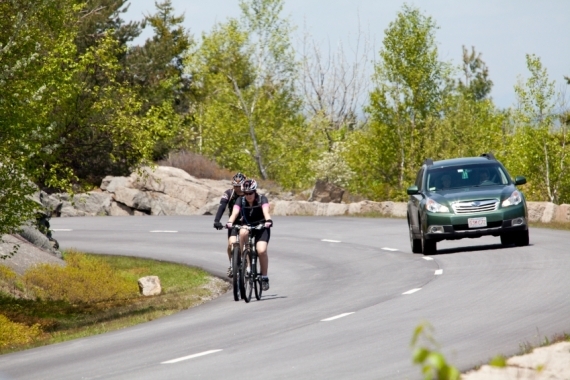 The 2.4-liter Ecotec four-cylinder engine manages an EPA-estimated 22 mpg city and 33 mpg highway. For comparison, Chevrolet’s compact Aveo only manages 1 mpg better on the highway. The Malibu carries an LEV-II emissions rating. Inside, the Malibu can brag about comfortable leather seats, a gorgeous dash with sharp, three-pod gauges and a clean center stack. There’s plenty of room in the rear seats for full-grown adults and the trunk could house a small family. It’s just that big. 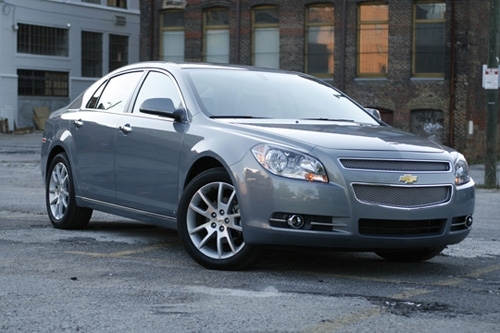 The 2008 makeover is still as attractive as ever, making the Malibu easily as good-looking as the rest of the mid-size field. With splashes of chrome to accent door handles, window sills and the car’s grille, there’s more than enough reason to stare in traffic. 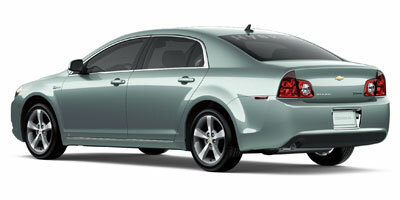 The 2009 Chevrolet Malibu LTZ is priced starting at $27,600. That puts it on the same shelf as Honda’s Accord EX-L at $25,605, the 2009 Toyota Camry XLE $25,750 and the 2009 Ford Fusion Sport at $25,825. Those models may seem less expensive, but the Malibu LTZ’s extensive list of standard equipment accounts for much of the gap. Similarly equip the rest of the field and you’d see price tags slowly inch upward. 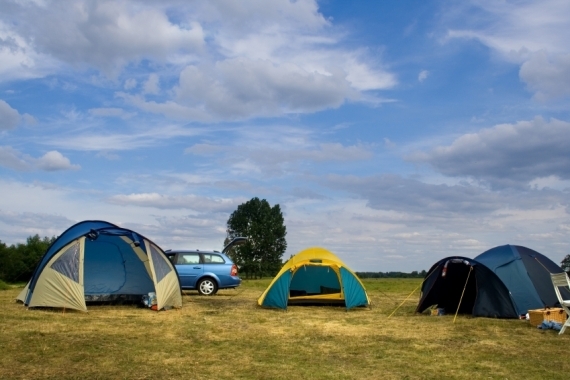 General Motors has a winner with its Malibu. It’s the car we’ve known the company was capable of building all along – the one we missed through years of uninspired styling and lack-luster quality. It’s a vehicle you end up enjoying almost in spite of yourself. A handsome interior, smart looks outside and fuel economy that’s well above the competition makes for something anyone could be proud to drive. This is a Malibu? Yes, it is.